The OMEGA™ PHE/ORE-6510 Series submersible electrodes are designed for use in drums, open tanks and streams, etc. The flat sensing surface is surrounded by a porous polyethylene reference junction which minimizes fouling. Electrode installation and removal done by a simple 1/4 turn quick disconnect. 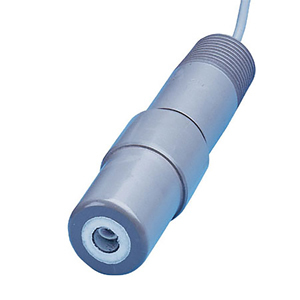 The cable assembly's cap has 1/2" MNPT thread, which can be connected to a coupling and support pipe. The pipe allows easy mechanical mounting and protects the cable from the liquid measured. The resulting assembly is lightweight for convenient handling when maintenance is needed. ATC is available as part of the mounting assembly. The flat surface design is well suited for applications with relatively high suspended solids or where flocculation operations require low velocities. Where only low velocities are present and coating is a problem, the electrode can be mounted at a 45° angle facing the flow so as to obtain increased scrubbing action across the measuring surface. Note: At the time of initial purchase, please order both electrode and mounting assembly. Mounting assembly includes assembly in which the electrode is mounted and 10' cable. If ordered with automatic temperature compensation (ATC), the temperature compensator is built into the mounting assembly. When the electrode has expired, simply re-order the electrode (the mounting assembly is re-usable). Mounting Assemblies Are Required for Installation. CPVC electrodes are only compatible with CPVC mounting assemblies. PVDF electrodes are only compatible with PVDF assemblies. For additional configurations see the Part Number Builder below this table. Temperature compensation is not required with ORP electrodes. Order electrode and mounting assemblies separately. Materials of construction must be the same for both electrode and mounting assembly. Mounting assemblies come with 3 m (10') cable with BNC connector cable. For non-standard cable lengths up to 15 m (50') replace the suffix "-10" in the model number with the desired length in feet, add $2 per foot to price. (Additional cost of $2 per foot applies to entire cable length).